How do I update/edit products in my Shopify Store? Updating the product details or print specifications of your artworks listed for sale are done both within creativehub and Shopify. To update, edit or make adjustments to price, print size, paper type, or any other print specification you may require, login to creativehub and choose your field for edit. Your Shopify products will automatically update! This ensures there are no discrepancies with product listings, and allows creativehub to accurately track limited editions where applicable. 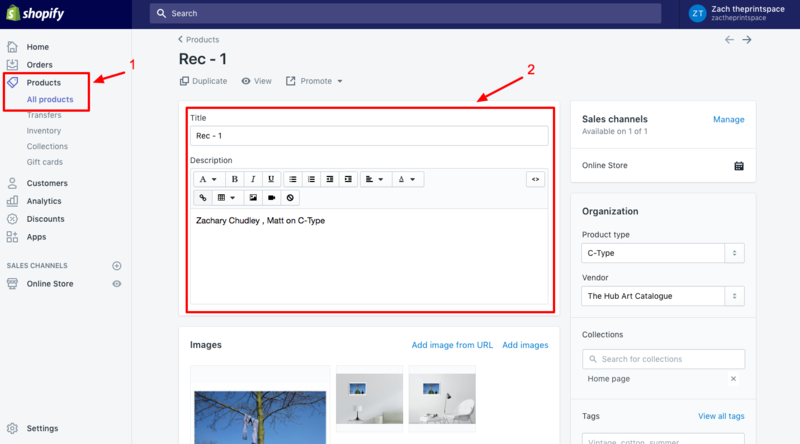 Product details, such as description, title and images can be edited within your Shopify account. To do this, login to Shopify, then navigate to the main menu and select ‘Products’ > the product you want to edit.